Lidar, UAV, Ground, Mobile, etc. OWLETS-2 is a follow-on study to better understand the behavior of ozone and related trace gases across the water land transition zone in the upper portion of the Chesapeake Bay. At coastal boundaries, significant water-land gradients can occur due to difference in surface deposition, boundary layer height, and cloud coverage from water to land. Prior studies have examined the Chesapeake airshed with respect to ozone, but many questions remain due to the lack of over water measurements and incomplete information of the trace gas vertical distribution. OWLETS-2 will use a unique combination of measurements during summer 2018 (June 6 to July 6) to more fully characterize the behavior of ozone in the Baltimore region. This will include two ozone lidar systems, multiple wind and aerosol lidars, ozonsondes, UAVs, research aircraft, and a host of in-situ measurements at various locations. Two key “super-sites”, will be located at UMBC and Hart-Miller island, to obtain measurements simultaneously over land and water. What is the spatial and vertical extent of the ozone (and ozone precursors) in and around the Chesapeake Bay? 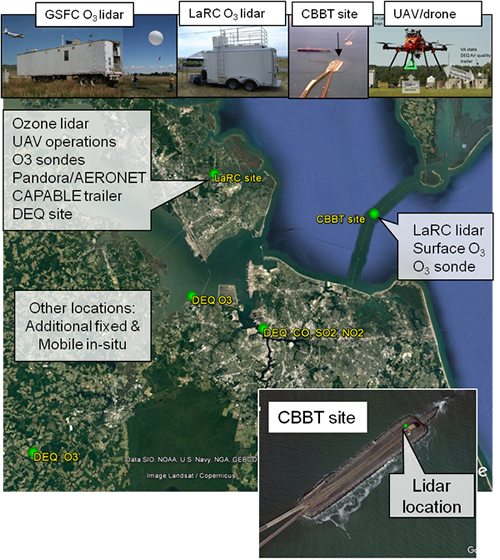 Synchronous lidar, balloon-borne, and surface observations of wind and ozone at HMI and UMBC will directly reveal vertical and spatial extent of ozone features. What are the mechanisms (low boundary layer, chemistry, weather) that produce high ozone over the Chesapeake Bay and lead to high ozone at locations on land near the Chesapeake Bay? The synergy of lidar, balloon-borne, and surface measurements at HMI and UMBC will directly reveal differences in controlling factors related to air quality episodes such as: boundary layer heights and chemical composition. How much of the ozone (ozone precursors) is a result of local sources (EGUs, mobile, ship, boat, etc) and/or pollutant transport (westerly, nocturnal low level jet) into Maryland? 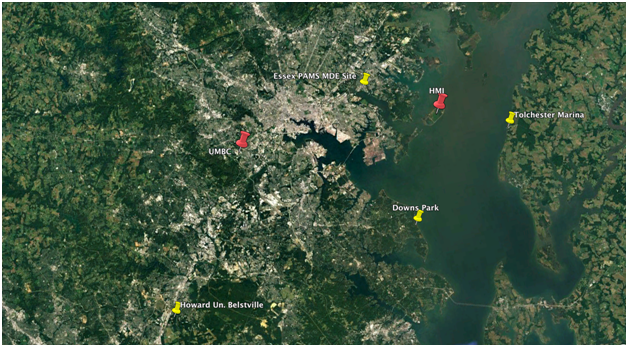 In commons flow patterns, observations at HMI and UMBC provide a detailed characterization of both upwind and downwind chemical composition that can directly quantify pollution transport entering the Baltimore region as compared to locally produced pollution. Why do the photochemical models appear to over-predict ozone concentrations in and around the Chesapeake Bay? Lidar, balloon-borne and surface observations at HMI are direct aimed at better understanding photochemical models by providing boundary layer height, chemical composition, and flow pattern differences between land and water. What source groups and in what locations do policy makers need to focus on to reduce ozone over the Chesapeake Bay? The results of this study will offer recommendations to policy makers and other interested agencies on how to more optimally place sensors in order to better reduce ozone over the Chesapeake Bay. How can measurements be better utilized (in conjunction with chemical transport models) to connect ground level pollutants to satellites in the upcoming framework of the NASA TEMPO instrument? Repeated high-resolution measurements under a variety of atmospheric conditions will help provide the statistics needed to test and optimize satellite retrievals and comparisons.